Do I have to have a boat license? Airlie Boat Hire do have boats suitable for those with and without a boat licence, we will provide you with a suitable boat that does not exceed a speed of 10kts in order to comply Marine Law. We will give you some information on boat handling and the waterway prior to departure. These boats are restricted to the bay only and cannot get to the islands. If you do have a boat license we can offer a range of different sized boats for your needs. These boats can get out to all of the islands and Whitehaven Beach. Our boats can be hired for a day or multiple days or at the last minute – a half-day hire subject to availability. We are also able to accept International Licences, you just need to check with us that they are recognised by the Queensland Government. We can provide Skippered Hire for anyone without a boat license but still wanting to get out to the islands. Please note, this service must be pre-booked, is an additional cost and is subject to availability. Can I take the boat to the Outer reef? No, our boats can get to the beautiful reefs around the islands with great snorkelling and diving. The Outer reef is a 3 hour trip, one-way. Our licensed Centre Cabin is in survey for 15 nautical miles past partially smooth waters and our Sportsrider is in survey for 5 nautical miles past partially smooth waters. Partially smooth means past the Islands, so there is a great scope for fishing. Please note, our poly boats do have area limitations and are only allowed within the very large and diverse Pioneer Bay. Where can I take the unlicensed Smartwave boats? Our poly boats do have area limitations and are only allowed within the very large and diverse Pioneer Bay. Can I bring my own tackle/ bait/ fishing gear? Absolutely! However, if you do not have your own gear, we have a range of equipment available for hire including fishing rods/basic tackle box, stinger suits, snorkelling gear, water sports gear and we can also arrange bait and ice for you. For the unlicensed SmartWaves fuel is included. The licensed vessels – fuel is not included. We take a $250 fuel bond for Sportsrider/Centrecab/Pontoon and $50 for Kakadu Tinny. We give you a full tank of fuel to depart with then on arrival back into the marina we calculate the fuel you have used and amend the difference (refund or charge your card). The price will be the fuel bowsers at Abell Point Marina on the day. Absolutely, we are happy to rent multiple boats to a single party, however, it is recommended that you book ahead so we can fully accommodate your needs. Please call or email us for a quote. Yes, we take a $200 deposit via credit card to secure your booking for the licensed boats, this will secure your booking and the balance of payment will be taken the night before your hire. For our unlicensed boats a $50 deposit is required. Is a bond required for hire of the boats? For the fuel, yes, but we do not hold a bond for the boat. However, we do tell our customers that they are liable for any damages that are caused to the boats, up to $1,000. Prop damage is the most prevalent, but we do try to have our customers minimise the risks for no damage with our run-throughs. Please ask us if you have any concerns. We hold a $250 fuel bond for the licensed boats (Sportsrider, Centrecab and Pontoon) and a $50 fuel bond for the Kakadu Tinny. When you return to the marina we calculate the fuel that you used and refund/charge your card the difference. What if the weather is awful and I choose to cancel my booking? 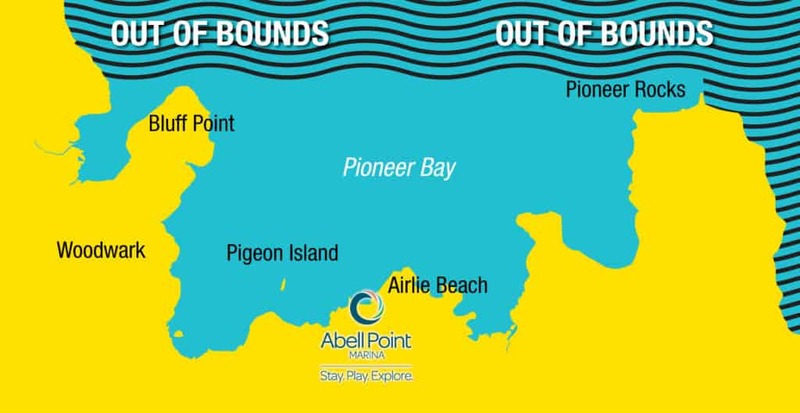 If the team at Airlie Boat Hire deem the weather to be unsuitable for boating, we will offer you the opportunity to reschedule or receive a refund. This decision will be made on the morning of your departure so please contact our office the night prior for an update. You must provide at lease 48 hours notice to Airlie Boat Hire to cancel a booking or full payment will be due. Where do we pick up the boats? 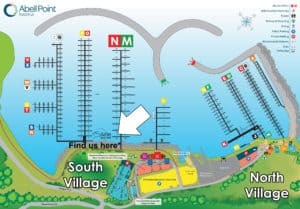 All of our boats are located on our Marina Berth – Abell Point Marina, Berth N00, South Village, Shingely Drive, Airlie Beach. Can we tow the boats away? Yes, you can tow the boats if you prefer, just contact us to arrange. The unlicensed boats cannot be towed, just picked up from our Marina berth. Can we have the boat delivered to a specific location? Yes, for an additional cost we can deliver and pick up the boats to specific locations. Please contact us for more information. Can we hire the boats for multiple days to camp on the Islands? Yes, no problem! However, you do need to purchase a camping permit to do this. All information can be found on the Queensland Government website at https://parks.des.qld.gov.au/parks/whitsunday-islands/camping.html#dugong_beach_whitsunday_island. Are children under 12 years old classified as a half person? Under the Queensland Laws, all children under 12 years of age are classified as 1 person; the laws in other states vary. Can we bring our own esky? Yes, you can bring your own esky, but we do provide eskies on all our Licensed Boats and our unlicensed boats have two built in eskies under the back seating. Your mobile phone, hat, sunglasses, sun screen, insect repellent, snacks, drinks and sense of adventure! We sell ice and bait and hire fishing rods/basic tackle boxes, stinger suits, snorkelling gear and water sports gear if you do not have your own. Children under 12 are required to wear a life jacket, we supply these also. Be aware that you will not always be fully shaded from the sun so you may also need other sun protection too.